Portadown's Michael Gault and Mark McAllister attack a delivery into the Linfield penalty area. Pic by PressEye Ltd.
Portadown manager Ronnie McFall is calling for some festive cheer as his players attempt to recover from back-to-back Danske Bank Premiership defeats. The holiday fixture list will serve up tests with Glenavon today (Friday) and Coleraine - the latter on New Year’s Day - as McFall’s men push for an edge in a four-way title race. “We sit as one of three sides joint second and four points off the top,” said McFall. “Although everyone is disappointed with defeats against Warrenpoint Town and Linfield, the objective was always to sit in contention around this time of the year so we can go into the festive schedule with confidence. “The Linfield performance featured the improvement we demanded after our Warrenpoint game and the team spirit remains strong. 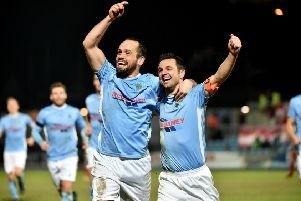 “A derby against Glenavon, especially on Boxing Day at Shamrock Park, comes down to who wants it more. “Then we have the New Year’s Day trip to Coleraine as another big match in this period when everyone is trying to gain an edge. Tickets for Boxing Day will be on sale today (Friday) from 9 o’clock at Shamrock Park. Supporters’ clubs will be operating bus trips to Coleraine on New Year’s Day as follows: OFFICIAL TRAVEL CLUB leaving Shamrock Park at 12.30 and JD Tipler’s at 12.45; SHAMROCK REDS leaving West Street at 12.45 and Shamrock Park at 1 o’clock; RICHHILL REDS leaving the village at 12.30, picking up in Portadown at 12.45. Both games will kick off at 3 o’clock.